Bhangra music has become more and more well known in the UK and around the world over the last thirty years. Bhangra has a really distinct sound and blends elements from various other genres to create an upbeat tempo. The genre has evolved with time, becoming a staple of festivals, weddings and many other celebrations. It has also had an impact on the nightclub scene. The reason the genre has become so popular is because of the blend of sounds and the amount of energy in the music. Listening to a song makes you want to dance, even if you don’t know what steps you should be doing. At weddings and other celebrations, Bhangra music gets people dancing and having fun. It is not unusual to see parties last several hours and have people on their feet for the whole duration. The popularity of Bhangra stretched around the world thanks to the DJ scene and the popular songs they made. Remixes introduced sounds from many different genres and helped it to grow even more. Nightclubs all over the world even started to offer themed nights showcasing the best new songs. If you’re planning a party and want a sure-fire way to get people dancing some Bhangra music is sure to do it. There are hundreds of songs to choose from so you can make the perfect playlist. Whether you want traditional sounds or modern ones you will be spoilt for choice. 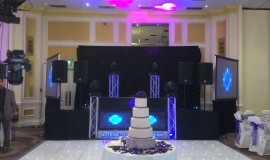 We can provide you with the ideal Bhangra and Bollywood wedding DJ, available for all kinds of events. Whatever the occasion, our DJ will provide the perfect sounds and entertainment to get the crowd going.